A review by NSW piano teacher, Sharon Ellam. What a delightful collection of ‘old faithfuls’ and several pleasant surprises! My first delight was the pretty paper inside! With an artistic, yellowed, aged look, big note format, clear sections with increasing difficulty, well packaged CDs, a brief musical dictionary of common terms, a page of blank large manuscript and a Repertoire Performance Log inside the back cover, this book is visually and functionally appealing. This compilation would be my ‘no brainer’ recommendation as a purchase for any young piano teacher needing some inspiration with young students, and students (adult or child) who are looking for one volume that enables a progressive journey through the classics with clearly identifiable goals. 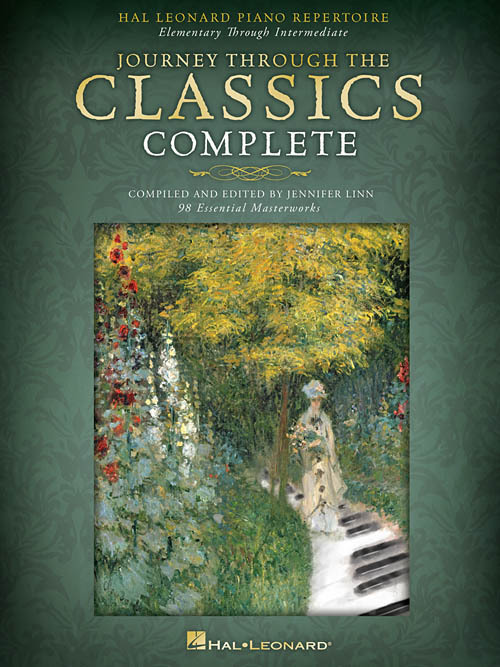 This Collection combines four ‘Journey Through The Classics’ Books – Elementary, Late Elementary, Early Intermediate and Intermediate – beginning with pieces at P Plate Piano level progressing through to about 4th Grade level. I have to put my hand up for pouncing on suitable 40 Piece Challenge pieces such as The Pennywhistle by Gottlob Turk and Gurlitt’s Little Bird Op. 117 No. 7. Four clear sections (Books 1 – 4) begin with a Reference Chart identifying the CD track number, Title, Composer, Era, Key, Meter and Challenge Elements. The Challenge Elements clearly identify the progression of musical elements to be mastered in each piece. The corresponding CD tracks, with quality solo recordings by Jennifer Linn (I was impressed by the clarity of the recordings in terms of articulation and colour), are masterful in their simplicity. I sat all night listening to the CDs whilst following the music & couldn’t get enough (and that was after two days of sitting at the piano ‘tinkling’ to my heart’s delight)!